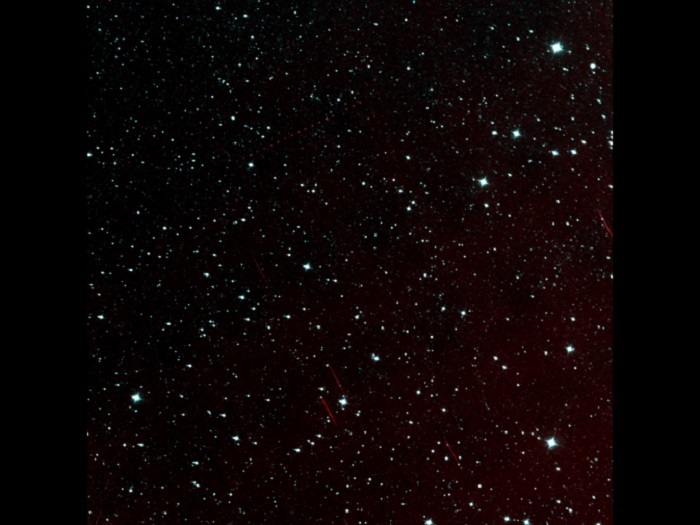 This image of a patch of sky in the constellation Pisces is among the first taken by the infrared cameras of NASA's NEOWISE spacecraft. NASA's Near-Earth Object Wide-field Infrared Survey Explorer (NEOWISE), a spacecraft that made the most comprehensive survey to date of asteroids and comets, has returned its first set of test images in preparation for a renewed mission. NEOWISE discovered more than 34,000 asteroids and characterized 158,000 throughout the solar system during its prime mission in 2010 and early 2011. It was reactivated in September following 31 months in hibernation to assist NASA's efforts to identify the population of potentially hazardous near-Earth objects (NEOs). NEOWISE also can assist in characterizing previously detected asteroids that could be considered potential targets for future exploration missions. "NEOWISE not only gives us a better understanding of the asteroids and comets we study directly, but it will help us refine our concepts and mission operation plans for future, space-based near-Earth object cataloging missions," said Amy Mainzer, principal investigator for NEOWISE at NASA's Jet Propulsion Laboratory (JPL) in Pasadena, Calif. "The spacecraft is in excellent health, and the new images look just as good as they were before hibernation. Over the next weeks and months we will be gearing up our ground-based data processing and expect to get back into the asteroid hunting business, and acquire our first previously undiscovered space rock, in the next few months." Some of the deep space images taken by the spacecraft include a previously detected asteroid named (872) Holda. With a diameter of 26 miles (42 kilometers), this asteroid orbits the sun between Mars and Jupiter in a region astronomers call the asteroid belt. The images tell researchers the quality of the spacecraft's observations is the same as during its primary mission. The spacecraft uses a 16-inch (40-centimeter) telescope and infrared cameras to seek out and discover unknown NEOs and characterize their size, albedo or reflectivity, and thermal properties. Asteroids reflect, but do not emit visible light, so data collected with optical telescopes using visible light can be deceiving. Infrared sensors, similar to the cameras on NEOWISE, are a powerful tool for discovering, cataloging and understanding the asteroid population. Some of the objects about which NEOWISE will be collecting data could become candidates for the agency's announced asteroid initiative. NASA's initiative will be the first mission to identify, capture and relocate an asteroid. It represents an unprecedented technological feat that will lead to new scientific discoveries and technological capabilities that will help protect our home planet. The asteroid initiative brings together the best of NASA's science, technology and human exploration efforts to achieve President Obama's goal of sending humans to an asteroid by 2025. "It is important that we accumulate as much of this type of data as possible while the spacecraft remains a viable asset," said Lindley Johnson, NASA's NEOWISE program executive in Washington. "NEOWISE is an important element to enhance our ability to support the initiative." NEOWISE began as WISE. The prime mission, which was launched in December 2009, was to scan the entire celestial sky in infrared light. WISE captured more than 2.7 million images in multiple infrared wavelengths and cataloged more than 747 million objects in space, ranging from galaxies faraway to asteroids and comets much closer to Earth. NASA turned off most of WISE's electronics when it completed its primary mission in February 2011. Upon reactivation, the spacecraft was renamed NEOWISE with the goal of discovering and characterizing asteroids and comets whose orbits approach within 28 million miles (45 million kilometers) from Earth's path around the sun.